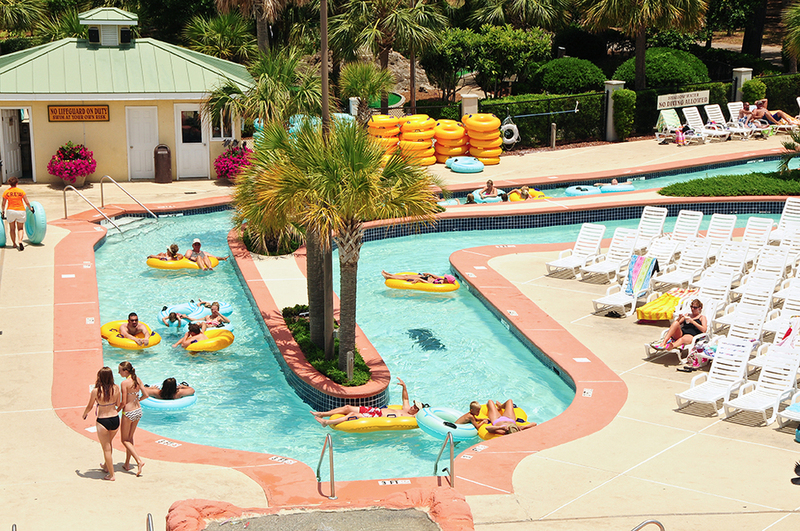 Our onsite recreation program and resort amenities provide added value and convenience for you and your family. For 50 years PirateLand has given families a great vacation experience and treasured memories from their visits to Myrtle Beach, South Carolina. Read below for more information on some our of amenities. Please note: Many amenities are seasonal and may not be open during your visit. Dates and hours of operation may vary. Access to our onsite water park is FREE for all registered guests. This includes our Olympic size outdoor swimming pool, a 510 ft. Lazy River (floats provided), and our brand new Pirate theme Splash pool. We provide hundreds of chaise lounge chairs among more than 18,000 square feet of sundeck. Pirate’s Oasis is open seasonally. THE OUTDOOR POOLS ARE NOT HEATED. GENERALLY THEY OPEN AROUND EASTER WEEKEND BUT IT DEPENDS ON THE WEATHER. Please call for more information. Preview our Waterpark and Recreation Gallery Below! The heated Indoor pool is open year-round. We also have an indoor Jacuzzi. Access is FREE for registered guests. Our 18-hole mini-golf course was completely re-carpeted in 2014. Located near the outdoor pool area the course features Pirate and animal figurines nestled among palms and banana trees. Open seasonally. Rates are $5 for one person, $8 for two, and $15 for four. All day passes are available for $8 per person and weekly passes are $25 per person. Check out the ACTIVITY SCHEDULE for discounts and tournament info. Generally open during the summer and some limited hours in the spring and fall. On Skeleton Island guests may access Paddle Boats and Kayaks. PirateLand boats may cruise around certain areas of Long Bay Lake. Starting in the Spring of 2019 guests may enjoy this amenity at no additional cost. Access is based on availability and some limitations may apply. Generally paddle boats and kayaks operate during the summer and some limited hours in the spring and fall. Only PirateLand boats are allowed in the lakes. Located right off PirateLand Trail is a snack bar and arcade. The menu includes pizza, burgers, ice cream and more. Open during the summer and some limited hours in the spring. Located next to Captain’s Galley the new basketball courts were just finished in the spring of 2014. There are four half-courts open for guest use all year. We also have two play areas for children; one playground across from the Camp Store and another play area near the indoor pool. This climate controlled room is located between the Laundromat and Camp Store and will accommodate up to about 40 to 50 people. We host many of our activities like Pot-Luck Dinner, BINGO, crafts, and other games in the Rec. Room. It features folding chairs, tables, book exchange, and magazines. Guests may rent this space for small group gatherings based on availability. Rental rates are $50 for 4 hours or $100 for 8 hours. We provide large trash cans and bags upon request. This outdoor covered Pavilion Picnic Area will hold up to about 130 people and is located next to the Indoor Pool. It features a fireplace and picnic tables. In the summer we have many events and activities here and during our Halloween celebration it turns in to a haunted house! Guests may also rent this space for group gatherings if available. Rental Rates are $50 for 4 hours or $100 for 8 hours. We provide large trash cans and bags upon request. Please note: Our ability to operate any/all amenities and/or activities is contingent on weather, park occupancy, maintenance needs and updates, and other factors. We do not guarantee all amenities will operate 100% of the time. Hours of operation may vary.